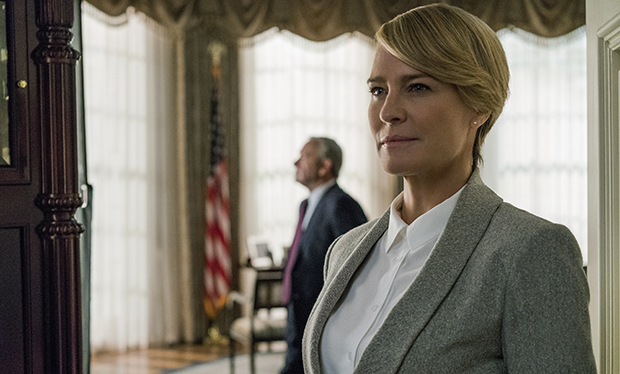 First lady and Vice Presidential candidate Claire Underwood (Robin Wright) addresses a campaign rally. She then joins Frank for another one. He's losing his voice but refuses her help in a patronising manner. Back on Air Force One, Claire receives information from the Secret Service that the sleeping Frank asked for on a suspicious looking man in the crowd. Once landed, Secretary of State Cathy Durant (Jayne Atkinson) gives Frank four options of people to arrest that could be the ICO terrorist. He is reluctant to arrest the wrong person on election day. Doug then brings him information on Conway's "heroic" act. Much later, Claire wakes up to see Frank awake and fully dressed. He phones Conway to say he shouldn't feel ashamed about whatever happened in Afghanistan. Meanwhile Chief of Staff Doug Stamper (Michael Kelly) chides the ex-Vice President and now Governor in a swing state for failing to implement voter centres. Stamper accuses him of making excuses and lying and he agrees to comply. Later Doug has a casual hook up but she leaves because he's not present in the room. The morning of the elections, campaign manager Leann Harvey (Neve Campbell) gets the early numbers and they're not good for the Underwoods. Nonetheless they are defiant. COMMENTS: Given that this was the pre-election episode I found it frustrating and dull. The Underwoods didn't really have anything on Conway who is bland as a antagonist. They are basically united. The pullback to Claire's lover in her bed is no longer shocking as we are used to their open marriage. The testimony of the press secretary came to nothing. And there are no consequences to the IT attack yet. A complete non episode with the exception of a rather nice and creepy tracking shot round the corner of Doug's bedroom. The theme of frustration continues - both in terms of Doug's hookup's sexual frustration and Claire's political frustration at not being Veep yet, and one suspects, not being President yet.